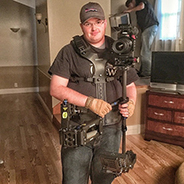 Canon 7D is more challenging to balance on the steadicam pilot, i need tips. This is very true, when I was taught that rule I always took it to mean that if you had gear that might be needed on the shoot but not all the time then build the rig out with it even if there was only a chance of using it, such as with a mattebox. Of course following that rule on anything bigger than a DSLR or maybe a Black Magic rig would seem rather pointless. My typical setup is a Pilot on 7D as well, one of the best things I did was add a battery grip on the rig, it doubled up the batteries (only option I could afford at the time) but also made quite the difference in weight distribution. Since this raises the lens height I also added a cage to top mount the matte box and this gave me enough weight to give a much better feel. I belive (and have been taught) to always look for practical weight additions first, but in the end do what you have to for a heftier weight on there. Adding some behind the camera weight will make a world of differece as well. Great resource, thank you for sharing. Thought I had done my due diligence before starting up another thread, apologies for that. Looks like the AC7 +SDI would be enough for me, I am assuming the prefernece is still towards LCD over OLED for outdoor work? My Pilot (AA) has served me well but I am looking to make swap over to a V-lock mount and as long as I am upgrading a little I wanted to get a monitor that will offer me more and RCA in. When I purchased my pilot it came with a HD/SDI fished up the post which the previous owner had put in. I am still a student and most of my work is small time with documentary as well as wirth a camp I work with in the summers, that being said most cameras I end up flying are of the prosumer variety and either have HD/SDI or HDMI outs. All that considered it would be great to get some opionions on what the best bang for buck is on the smaller end of monitors. I done neccessrliy need anything much bigger that the 5.8" that it came with so my big wants are input options, decent brightness for outdoors, and being able to power off the V-lock 12V. Thanks in advance for any suggestions. Looks like a case of long time listener first time caller for me, I was recently tasked with making sure the follow focus my school is looking to get can function both off and on our Stedicams. While I could easily locate an adapted plate for them to use when off the rig, I am having more trouble sourcing out a suitable LEMO cable for running the receiver's power while flying. Our current fleet is 2 Zephyrs and a Pilot, if I am correct in my research I need a 3-pin LEMO male to 4-pin LEMO male (using Ikan PD2 remote system). I would be greatful to hear any suggestions or if anyone out there has a good "go to" guy for cables of this sort. I know that it could be possible to fly with the V-lock on the sled but given our standard camera rig it would max the Zephyr out which I do not want to do if avoidable given the fact that a good deal of the users are flying for their first time with a real rig. Thank you for any adice you might have.